Elements in production for almost forty years have received international awards and are now on display at the Museum of Modern Art in New York and the Centre Georges Pompidou in Paris. All modular components are designed to meet various requirements of use, with or without wheels, can be stacked vertically using a simple joint: try them in the bathroom, bedroom, kitchen, living room, and various solutions in different colors, glossy white, silver gray, red, gloss black. 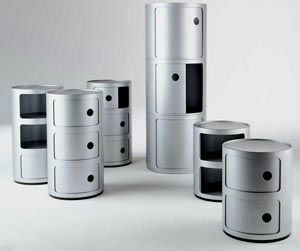 Available for delivery in Silver Grey and White gloss finish.